It's obvious that game testing is an essential stage in the board game development. I don't need to convince anyone to agree with this statement. Great feedback from different groups of people is crucial and will help us to ensure that our game is best possible! For family and children games one of the most relevant group is children! And it's very hard to make people play in your game, especially when there are so many opportunities for playtesters To convince so busy people that it's worth giving up their time to play your game and provide you with a detailed feedback can be tough! It's even more tricky to get your game tested by children! However, schools are very helpful and making our life much easier! Kids' point of view will be honest and will give you a chance to improve your game! Yeah, that's so true! Schools are great, indeed! I decided to test my new board game in one of them. I designed the game for children from the age of 10, so I felt it is vital to know the kids' opinion! It was the first time I've done it, and I had no clue how it's going to work! I went to the school and spoke with the head teacher. He was very kind and keen to help me with the project. It's an exciting and beneficial cooperation between a school and an author/publisher. - Make parents aware of modern board games as well. They may start spending their family time playing tabletop games. - Playing board games boosts children IQ. More in my article Board Games - A Great Tool to Train Your Brain. - I feel it is a good practice to support the school with a donation of a few copies after printing the game. 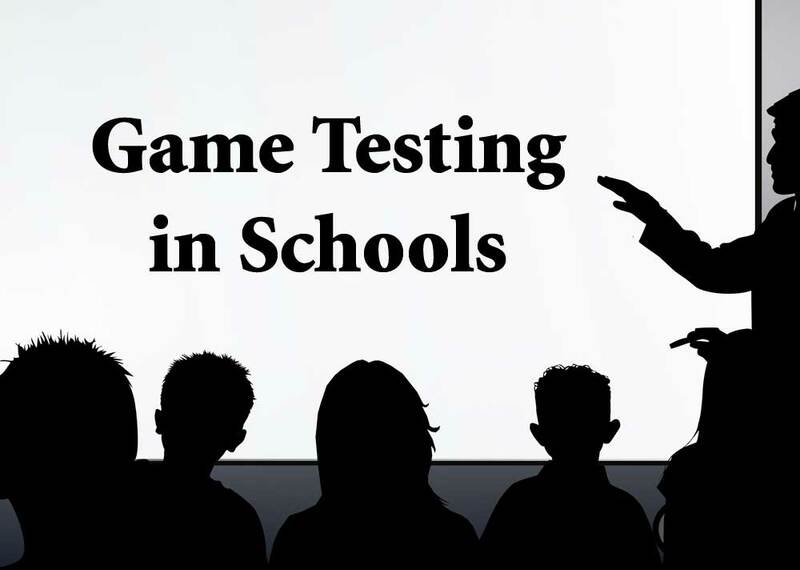 - Marking your game as “tested in the schools” works like a verification of your game! First of all, be aware that the schools are busy. If you want the school to play your game properly, you must make their life as easy as possible! I know it is very time-consuming, but it's worth it! Teachers will appreciate your hard work! - You got well-written rulebook ready. Print it yourself in full colour! Don't expect teachers to do that for you! - Print and Play is a big NO! You have to make the prototypes! It should be sturdy and well made. Don't do a cheap crap but good quality one. Usually, there will be about 25 children per class. If you designed your game for four players, then you should create six prototypes so that the whole class can play at once! If you want your game to be played by two players, make ready a little more prototypes. While handing your prototypes to the school, you should already know what you are looking for, why you spent so much time and money by putting them together. Teachers and children most likely are not the board game experts and do not expect from them to give you a good feedback without your help. Again, you have to make it straightforward! By creating a simple and easy to fill form will provide you with exactly what you are looking for. Of course, print them for the school as well! 3. What skills the game helps kids to develop? 8. What makes the game difficult for children? 9. Any suggestion and comments? Make sure to include any relevant questions, concerns which will help you to improve and develop your game. Spend some time and think about it. Usually the best option for short, quick games (max 30 min gameplay with setup). Usually the best option for long games (above 30 min gameplay with setup). - You have a pretty good chance to take part in the testing session. You can make some notes; however, you shouldn't interrupt the session! - Fewer children involved but more interested in board games. - You will need to do some promotion to convince kids (or their parents) to stay after school. Did you ever test your game in schools? Please, share your experience with us! I'm passionate about creating board games, but that doesn't mean I'm a master! I'm fascinated about training martial arts, but that doesn't mean I'm a great warrior! I love baking sourdough breads, but that doesn't mean I'm a professional baker! I have six children, and that doesn't mean I'm the best father in the world! And finally I love God, but that doesn't mean I'm a good Christian! But what really matters is that I LOVE God, my family, my life, and things I do! © 2017 Mateusz Rakowski. Awesome Inc. theme. Powered by Blogger.